This fast rover with a Manga name can be used for science or whatever you like on every world. 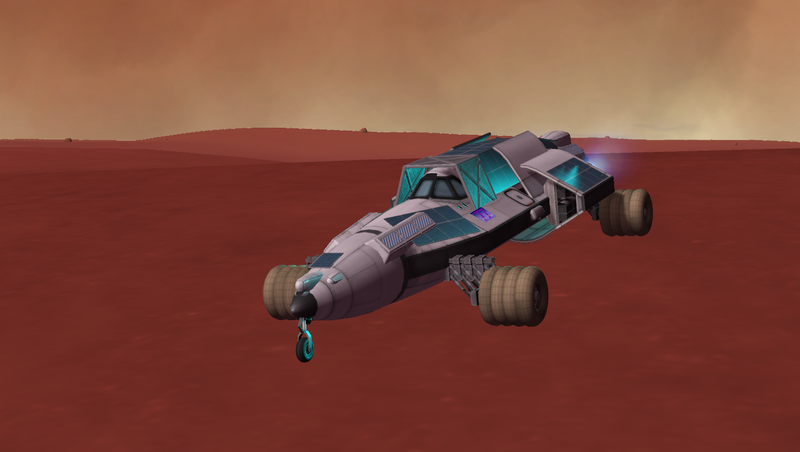 Its 16 rover wheels give it a top speed of 41m/s on flat terrain on worlds without atmosphere and Duna, on Kerbin at sea level it maxes out at 30m/s. The four ion engines give it a potential unlimited speed, on Duna a top speed of 75m/s is possible (not recommended). On Minmus the four ion engines give it a TWR >1. Obviously the ion engines are useless on Kerbin, Laythe and Eve. Two fuel cell arrays make it possible to power all wheels and ion engines simultaneously, without ion engines the amount of LiquidFuel and Oxidizer should make it possible to circumnavigate Duna - unless you’re driving at night all the time. It’s got safety features all around, there’s a medium landing gear on the tail to help it right itself when you end upside down. On both the nose and rear two seats of landing gear point up to help during difficult situations. The landing gears on the nose and tail are very helpful, they absorb most impacts. One landing gear on the bottom and the metal plates help with impacts after long jumps - there’s a limit to what they can absorb. The metal plates on the roof and the open cargo bay protect the cockpit - again it’s pretty sturdy but not invincible. It’s possible to de-orbit and land on Duna, it’s also possible to use it as a spaceship. De-orbit is not recommended on Eve, Kerbin, Laythe, unless a large heatshield is installed. Science instruments not included. Probe core not included. Mechjeb Rover Autopilot strongly recommended.